I bought the cream and its pretty see through looks cheap and its too short. It come about 3 or 4 inches from the ground. I wasn't impressed unfortunately. 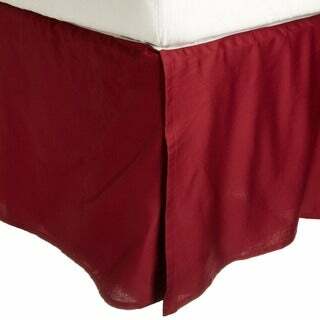 Beautiful bed skirt, however it is not solid like someone else commented as well which is WHY I bought it. The striped pattern matches my Duvets perfectly and look more classy than the picture without stripes. The 15 inch drop is great. For this price and the nice quality you can't not buy it!! I would buy another one of these! Not holding up so well! Bedskirts are just not made like they use to be. The fabric that holds the skirting in it's shape and usually stays hidden under the mattress is CHEAPPPPP! It tore very quickly and is right at the hemline of the ruffle, so it shows. The other issue I have is that it is slightly big. I have a king and I ordered the king. The skirting hangs over the box spring just enough to show about an inch of the material that should be hidden. It is no where near as nice looking as the pictures shows. In the picture it seems to fit perfect and look very talored, not so! Slightly disappointed with the construction of this item. Multiple threads were dangling from the poorly tailored seams along the perimeter's base. I ironed the seams and removed the threads with a scissor. The material is extremely soft and thus, extremely wrinkled when removed from the packaging. Overall, the price was right and the color was true to description. I am dedicated to researching catalogs and websites for the lowest price. I firmly believe Overstock.com offers a decent product for a signficant reduction in cost. I've never felt fabric this soft and luxurious before. Now I want a set of sheets made from this gorgeous fabric. It's the softest, silkiest ever. And when I ordered a white bedskirt, I expected an ordinary white cotton bedskirt, but this is white on white and the highest thread count I've ever had anything made of before. It is so elegant, and I'm so happy I bought it on an impulse. I certainly would recommend it to anyone, whether you need a new bedskirt or not! I purchased this Ivory colored, tailored, cotton bedskirt for my bachelor son, who moved to a new studio apartment and purchased an extra long twin bed to be used as a couch in daytime. I searched your website and others and could not find an extra long twin bedskirt, so I ordered just the twin. This meant I had to remove the back panel (the bed would be against a wall) and sew the extra length, in pieces, by hand, to the bedskirt. No small task. However, it turned out fine and looks very nice now. The cotton used in this product is excellent, but you have to iron it before use as it can wrinkle easily. A bit shorter than I wanted, but almost perfect! I was very happy when it arrived and did not have stripes as many of the reviews had mentioned. I used it on a 14" high metal frame without a boxspring - only a memory foam mattress. It is perhaps a bit less than an inch shorter than I would like, which isn't such a big deal, since only one side is visible from the entrance to the room. This would not be an issue at all if I had the bed against the wall. It is a very soft and light fabric, not structured at all, which is exactly what I wanted. I purchased the King Mint, and it seems a bit lighter/brighter than the pick. Great deal for the money. I ordered the beige and it is more like a peachy gold. It is also very thin and not good quality. It looks like no more than 180 to 200 thread count. It doesn't really blend with my comforter which is a black and beige damask. I'm not going to send it back because it would be more of a hassle than what it cost. I don't have the specifications on the height of my box springs, but this bed skirt does a great job of reaching exactly to the floor. I recommend that you measure from the floor to the top of your box springs so you know the drop length before you buy any bed skirt. I did that and it worked out perfectly with this purchase. I bought the burgundy one and it is true to its rich color on the website. It looks great with my bed linens. And the fabric is a nice weight and has a pretty sheen to it. Be sure to iron it though when it comes out of the package. There will be wrinkles, but after you iron it once you're good to go until you wash the darn thing.